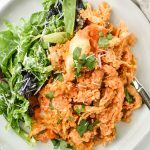 The Buffalo Chicken Quinoa Bake has all the best flavors of buffalo chicken in casserole form, lightened up with Greek yogurt and baked to perfection with veggies and quinoa! 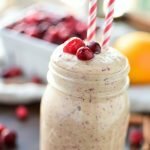 This is a pretty simple recipe which just takes a little bit of time to put together. I think my New Year’s cooking resolution will be to work on more recipes you can cook completely in one dish. Not only will this save you time, but it will save ME time. 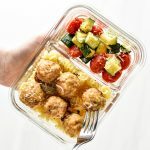 With the exception of the quinoa (which is made in the rice cooker), the remaining components are all cooked in the Dutch oven for this recipe. For the quinoa, grease the inside of the rice cooker with coconut oil, throw (gently) in a can of broth and a cup of dry quinoa, and there you go. Quinoa in 40-50 minutes. I don’t even stir before I start it up. It’s so much easier than paying attention to another boiling pot on the stove. In this recipe, I get the quinoa started first, so it’s ready when all the ingredients get mixed together and topped with cheese, see below. After the quinoa gets going, start some chicken breasts in a preheated oven. While that’s cooking (25ish minutes depending on the thickness of the chicken breasts), prep veggies! This dish comes together quicker than it seems like it might. You’re sort of preparing the next steps while the current step is finishing up. 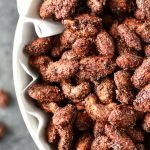 Overall, I’m pretty thrilled for this recipe to be a part of Project Meal Plan, because I love it that much. I’m always excited for buffalo chicken anything, and this one hits the spot. It’s also perfect for reheating and eating for lunches. Cook Quinoa: Use coconut oil to grease the inside of the rice cooker dish. 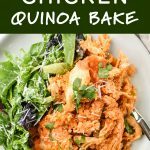 Add quinoa and chicken broth to the rice cooker and set to cook on the brown rice setting (find detailed instructions to cook quinoa in the rice cooker here – find detailed instructions to cook quinoa in your Instant Pot here. 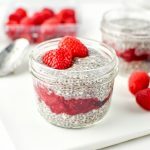 You can also cook the quinoa by the package directions if you do not have a rice cooker or Instant Pot). Cook chicken: Preheat the oven to 400 degrees. Place chicken breasts in Dutch oven (preferably) or large oven safe skillet. Coat with 1 tablespoon olive oil, and 1/2 teaspoon each salt and pepper, flipping to coat both sides. Place in preheated oven for 25-30 minutes, or until cooked through to 165 degrees. Leave the oven on the for the final baking step. You can also use rotisserie chicken or any other leftover shredded chicken. Remove chicken from the Dutch oven and set aside. When it’s cool enough to do so, shred the chicken. 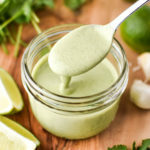 Make hot sauce mixture: In a medium bowl, stir Greek yogurt, eggs, hot sauce, parmesan cheese and 1/2 cup mozzarella cheese until well combined. Set aside. Heat the leftover chicken juices over medium-high heat. 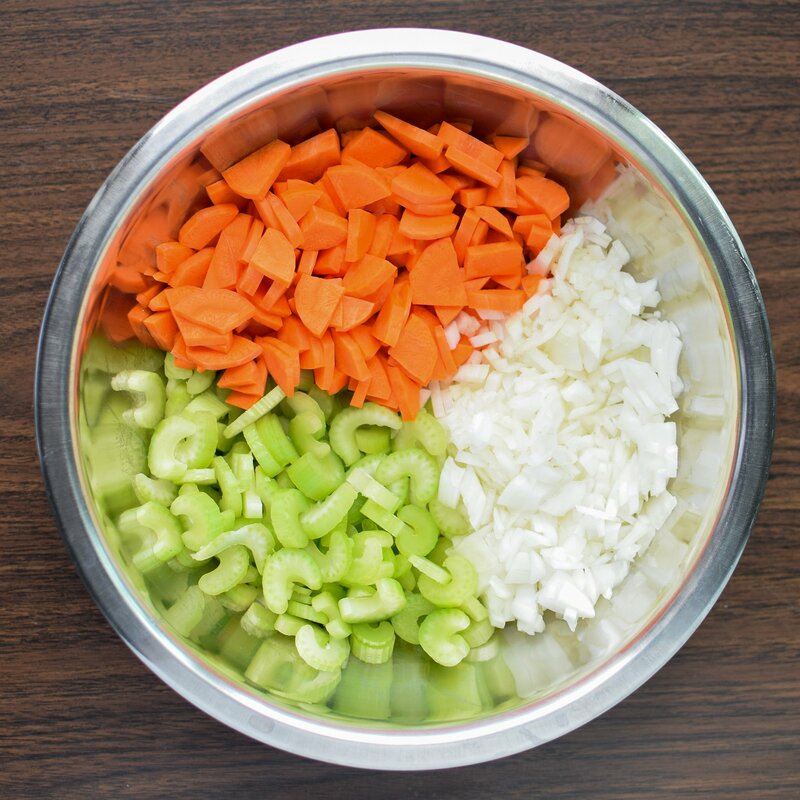 Add onion, celery and carrot, and 1/2 teaspoon each salt and pepper. Stir frequently for about 8 minutes, or until the onions are translucent. Add tomato paste and garlic powder. Stir for about 2 minutes, and then remove from heat. 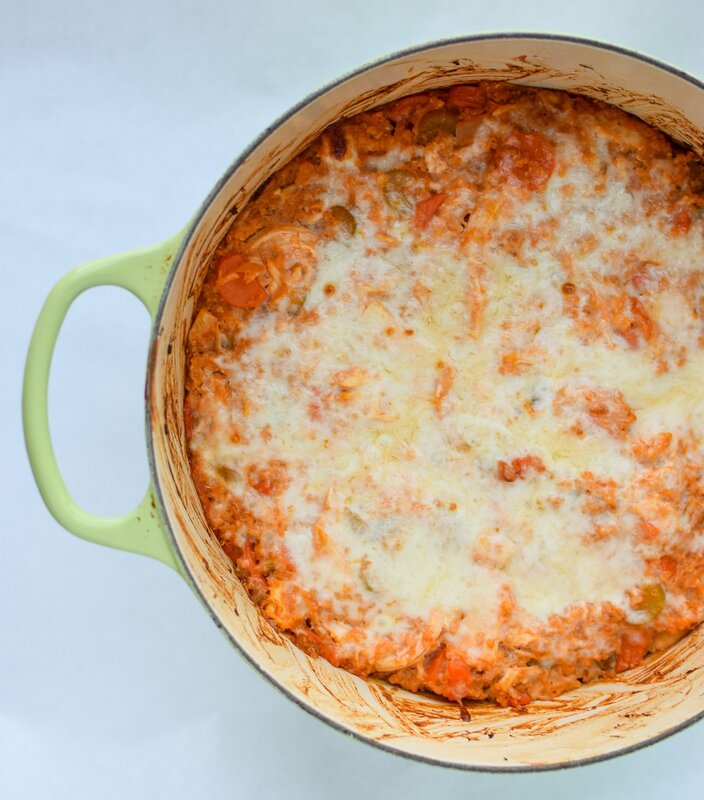 Put it together: To the Dutch oven with the vegetables, add chicken, quinoa, and hot sauce mixture. Stir until completely combined. Top with remaining 1/2 cup mozzarella cheese. Bake with lid on for 20 minutes. Bake with lid off for an additional 5 minutes. 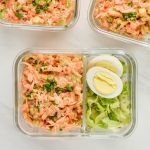 Serve immediately or store in an airtight container and eat within 4 days. 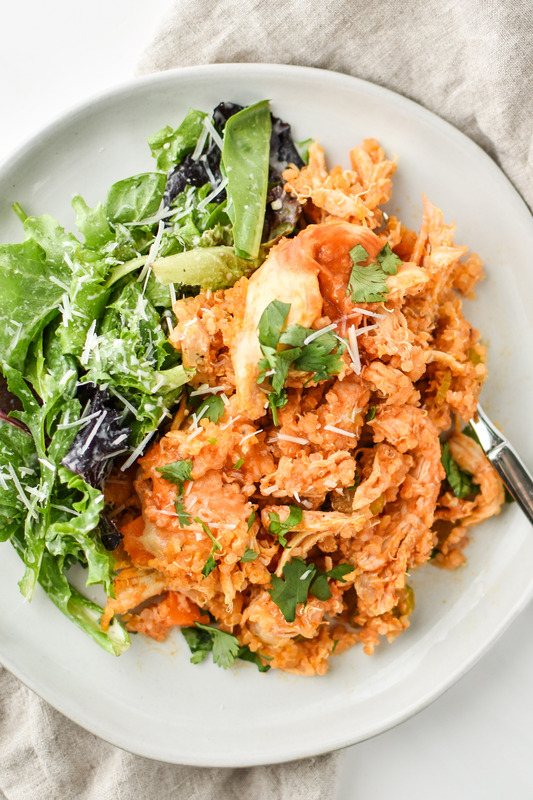 Recipe inspired by Buffalo Chicken Quinoa Casserole by The Iron You. Nutrition information estimated with MyFitnessPal. Recipe video added and recipe updated on 10/08/18. 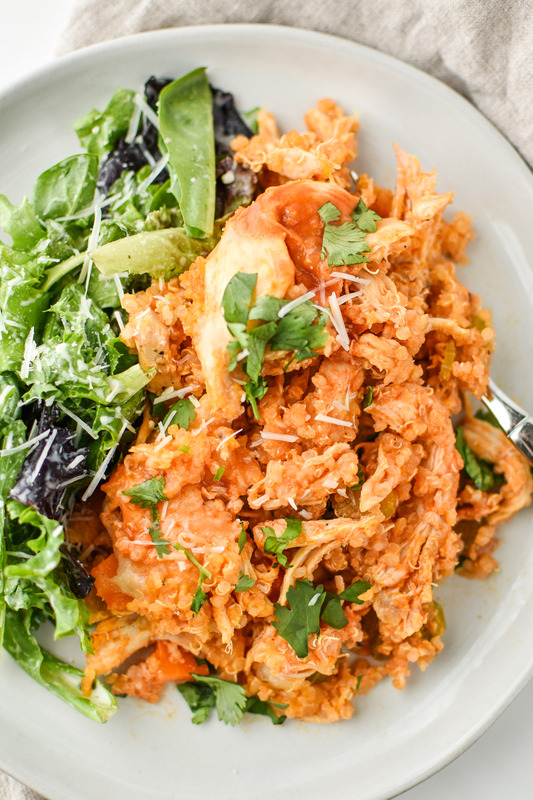 Thank you so much for checking out the Buffalo Chicken Quinoa Bake! 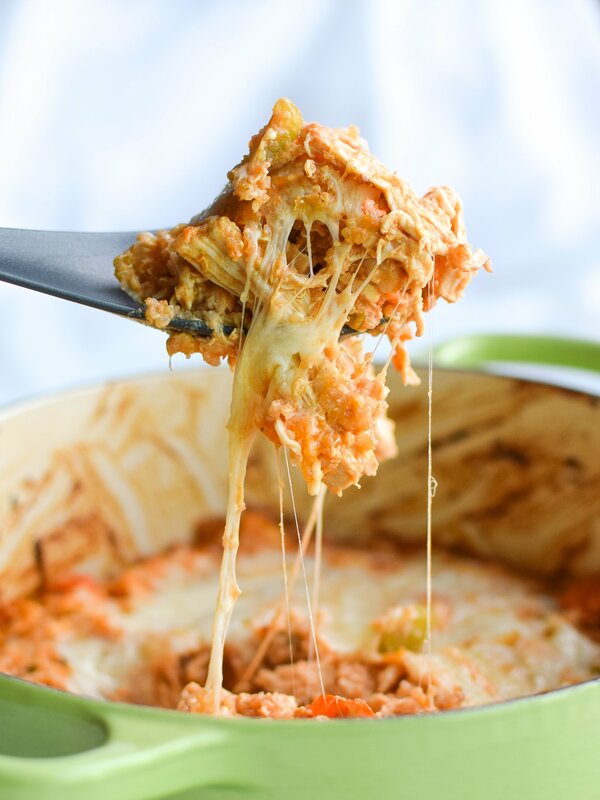 Tag @projectmealplan on social media if you make this awesome buffalo bake! I’d love to check it out. And be sure to follow me on Pinterest for meal inspiration every single day!